Preheat oven to 180°C/350°F. In a bowl, mix flour, baking soda, and salt. In another bowl, beat soft butter, brown sugar, and vanilla sugar until fluffy and pale. Beat in eggs, one at a time, until fully incorporated. Add flour mixture to the butter mixture. Whisk until combined, then fold in chocolate drops. 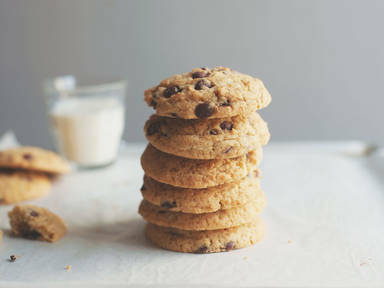 Scoop dough onto a lined baking sheet, leaving enough space in between cookies. Flatten slightly with the back of the scoop. Bake in preheated oven for approx. 10 – 12 min. at 180°C/350°F until golden. Cookies should remain soft on the inside. Allow to cool for approx. 10 min. before serving.